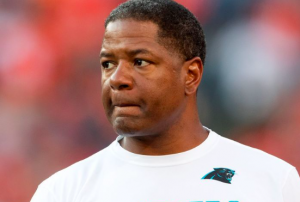 The Arizona Cardinals have chosen Steve Wilks as their new head coach. Wilkes was previously defensive coordinator for the Carolina Panthers. The Cardinals have scheduled a press conference Tuesday to formally introduce Wilks. The 48-year old Wilks will replace Bruce Arians, who retired from coaching at the end of the 2017 season. The Cardinals are the final team to fill its head coaching vacancy. Officially, the Giants will introduce Pat Shurmur later this week while the Colts and Lions will have to wait until after the Super Bowl to introduce their new choices. Arizona needed three weeks after Arians retired to make a decision. But according to reports, they were impressed by Wilks during his second interview with the team on Friday. This will be the first head coaching gig for Wilks, who has been an assistant in the NFL since 2006. Prior to that, Wilks spent more than a decade as an assistant coach in the college ranks. He has worked primarily as a defensive backs coach, with stops in both Chicago and San Diego. Wilkes has spent the last six seasons with the Panthers, serving as assistant head coach in 2015 and 2016. He was promoted to defensive coordinator for the 2017 season, replacing Sean McDermott, who left to become head coach of the Bills. Under Wilks, the Carolina defense finished 11th in the NFL in points allowed this past season. However, the Panthers were top-10 in yards allowed and had the third most sacks in the NFL. Carolina also had the second highest blitz percentage in the league at 44%. Wilks figures to bring his aggressive style of defense to the Cardinals. Arizona ranked 19th in points allowed this past season. Despite mediocre numbers from the Arizona defense in 2017, Wilks inherits quite a lot of talent on that side of the ball. The Cardinals boast a talented secondary led by Patrick Peterson and Tyrann Mathieu. Arizona’s defense also features Pro-Bowl pass rusher Chandler Jones, who collected 17 sacks in 2017. With a solid foundation and plenty of young talent, the Cardinals could become one of the best defensive teams in the NFL under Wilks. The only caveat is that Wilks ran a 4-3 scheme in Carolina while Arizona had a 3-4 defense under Arians. Of course, there is great uncertainty for the Cardinals on the offensive side of the ball. Arizona was just 25th in the NFL in points scored last year. On top of that, quarterback Carson Palmer decided to retire following the season. Backup Drew Stanton is also set to hit free agency. Wilks and the Cardinals will have to find a new starting quarterback through either free agency or the draft. Arizona owns the 15th overall pick in this year’s draft but has just five total picks. Ultimately, who the Cardinals find to be their quarterback will have a huge impact on whether Wilks is successful in Arizona or not. However, he’s proven himself capable of putting together a strong defense. If Wilks can get the most out of Arizona’s defensive talent, he may have a chance to have immediate success with the Cardinals.